Many bowhunters shoot bows that are between 40# and 55# because they're not comfortable pulling heavier bows. This group includes many younger bowhunters, some female bowhunters, and many older bowhunters. The good news is that in Dr. Ashby's testing, even 40# recurve bows could breach the heavy bone threshold 100% of the time when shooting the proper arrow and broadhead combination. That's great news for light bow shooters. 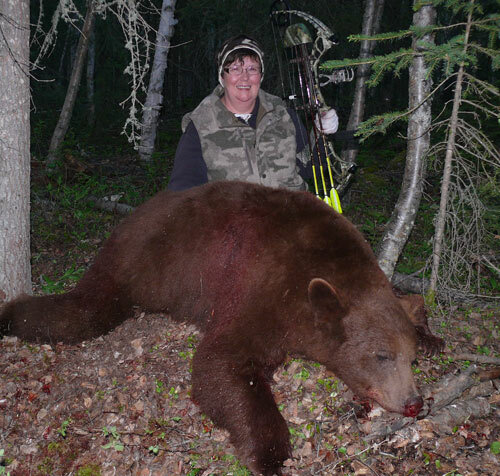 Olivia Gentile used GrizzlyStik Momentum tapered carbon arrows and Silver Flame 125 grain GrizzlyStik broadheads from a 50# Mission Craze to harvest this monster bruin. For all bowhunters - an arrow and broadhead set up that can give them reliable lethal penetration, even when bone is encountered, is the most important element of their bowhunting gear - period. This is especially true for bowhunters shooting bows between 40# and 55#. Once bowhunters actually try heavier arrows with the right kinds of broadheads they never go back. When starting out, most bowhunters are advised to shoot light arrows with light broadheads so they get faster arrow speeds, higher kinetic energy numbers, and flatter trajectories. The problem is that they often also get poor penetration and start losing animals. The worst case scenario is when they get lucky for a while and harvest a few animals - even though getting poor penetration. Sometimes their luck holds our for quite a while. When that happens, they start to believe that light and fast is the way to go. Eventually though, things go wrong. Shoulder blades are hit, a leg bone, or they fail to penetrate well enough for a clean kill - even on a broadside shot. Eventually they start to question. What's wrong? This is crazy - why aren't my arrows able to give me clean kills? Normally, there is a final - "That's it! 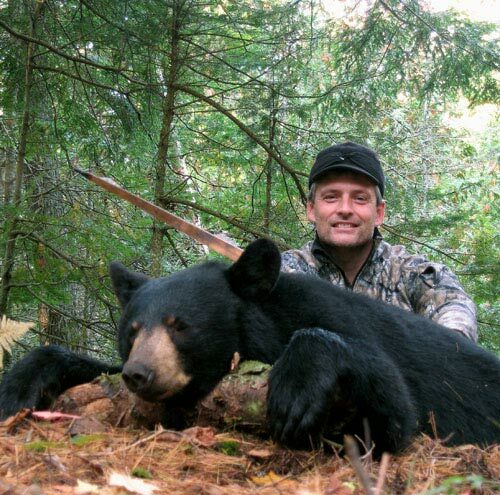 That's the last animal I am willing to lose to an inferior arrow and broadhead set up." The lucky ones start researching for a better arrow and broadhead combination before they lose too many animals. Light bow shooters absolutely need to set themselves up with efficient arrow and broadheads that are proven in the field, known to give complete lethal penetration on big game animals - even when shot from bows under 60#. Here is a bowhunting truth: Every bowhunter should be shooting an arrow and broadhead combination that sets them up for success. Every bowhunter should be shooting arrows and broadheads that can still harvest an animal even when things go wrong. To accomplish that, you need heavier arrows and higher FOC values and the easiest, fastest way to accomplish that is by shooting the GrizzlyStik system of arrows and broadheads. We recommend 650 grain arrows (minimum) with at least 19% FOC (forward of center). With GrizzlyStik arrows and broadheads you can shoot arrows that bust through bone and dramatically increase your odds for complete penetration on big game - even from bows as low in poundage as 40#. We know that shooting 650 grain arrows and fixed blade broadheads might go against what most bowhunters have been told for years, but we are not just talking theory here. We are talking about results. If you'd like to read up on all the testing Dr. Ed Ashby did to identify the 650 grain heavy bone threshold and the 19% FOC threshold - Read the Ashby Reports. If you'd like to see the actual results light bow shooters have had with the GrizzlyStik system keep scrolling. When you get to the bottom of the page, consider checking out the GrizzlyStik 650 Grain Challenge. Happy Wife, Happy Life - "We were introduced to GrizzlyStik at a local NC hunting festival. I was immediately confused at the idea of such heavy arrows and point weights. After reading all the Ashby reports I decided to build some EFOC arrows for both my wife and I.The last few years she has taken deer but only by pure luck due to terrible arrow performance. She is a 24.5” draw pulling 47 lbs on a Malthews SDX. So I built her new arrows to 504 grains at 25% FOC, tipped with a 125 Samurai. The shot on this doe landed higher than desired but the arrow entered on a rib, (breaking it) hit the spine, (breaking it) and out the top of the far shoulder (breaking it also). The deer was dead where it stood. The devastation and laceration was unlike anything I’ve ever seen. 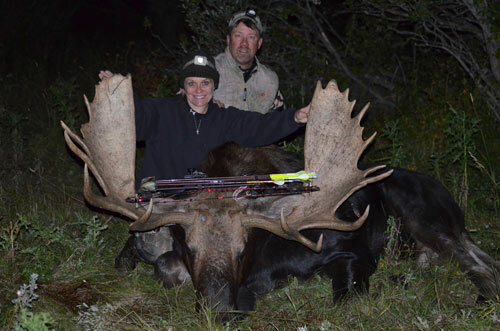 Brenda Johnson took this Shiras moose with a 48# bow, a GrizzlyStik tapered arrow and a 125 grain GrizzlyStik Samurai single bevel broadhead. 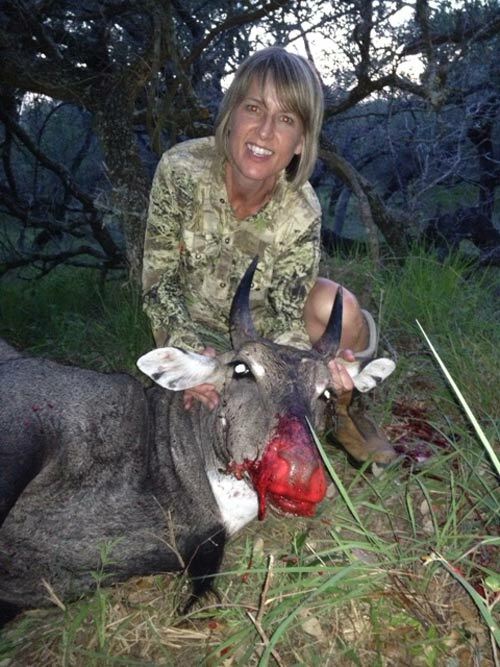 "Attached is a picture of Rhonda the Nilgai Slayer. 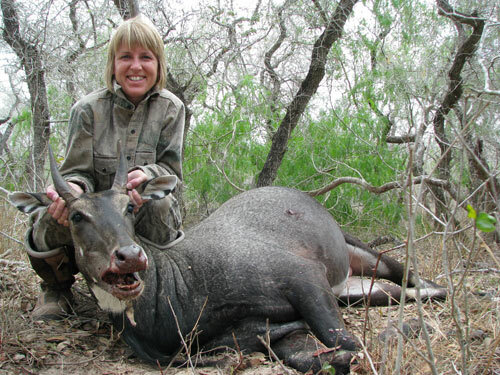 This was her second archery hunt on the King Ranch and her second mature bull nilgai. As you know, she uses the 125 gr Silver Flame, 43# pound bow, quartering shot, and.....a complete pass through. He came into a waterhole on the last minutes of the hunt at high noon on the afternoon we were going to depart. 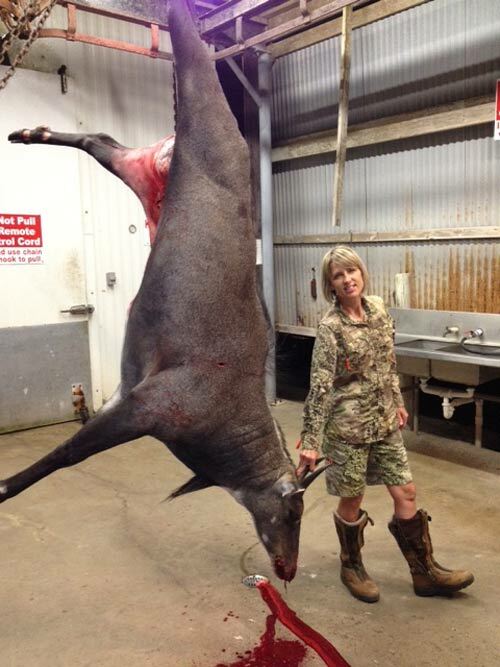 BTW - the bull she shot last year will be #5 archery free range nilgai once they update the records. I have not had her second one scored yet, but it is a good bull also and very close to the first one she shot. 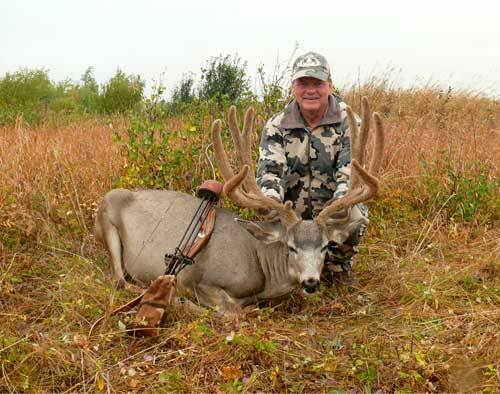 No, I did not get one on this hunt and yes, I’ve heard about it more than once." "Here's a picture of a bear I took with the GrizzlyStik system. The bear was 205 lbs Field Dressed-Approx 240-250 lbs live weight. The bow was a Bruin Recurve-56 lbs. I was about 11 yards from the bear when I shot and the 630 grain GrizzlyStik Momentum arrow gave me complete penetration. Bear went 70 yards. " "Great visiting with you on the phone today. As I mentioned, attached are the field pics and hanging pics of the nilgai. As I mentioned, considering the recommended gun for these strong animals is a .375 H&H Magnum, Rhonda’s was the most impressive kill I’ve seen in years of archery. She has a 43# draw weight and using a 125 grain Silver Flame obtained a complete pass through on a quartering shot taking out both lungs – but you couldn’t tell that with all the red foam coming out of his nose! Bull was dead w/in 75 yards of the treestand. She did it all on her own as no guide was there. I’m personally blown away she had a pass through on this big and dense of an animal with that light of draw weight....that speaks volumes for that head." "I have had a pretty good fall so far. Shot this mule deer Sept 1 out of a treestand at a waterhole. 17 yards angling behind last rib up to opposite shoulder right to the fletch. Made it 75 yards on a run. Arrow and broadhead in perfect shape to use again. Still shaving sharp. He grosses 171 and nets 166. 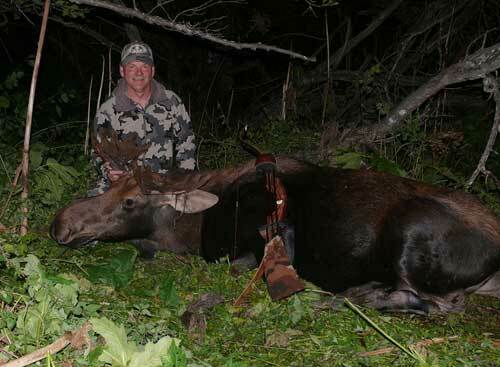 The moose was shot Sept 13 out of a different waterhole. Used same arrow. 22 yards broadside. Entered thru ribs clipping one slightly. He made it app 60 yards. Arrow hanging by the fletch on the offside. He broke my arrow when he went down (got up and down again and up and down again). Couldn't find the broadhead part. Grrrrrrr!! Be a great eating bull. Had a bigger bull come in grunting about 15 min later and stand right in front of my stand. Had 2 cows fighting. Great night. EQUIPMENT -- Jack Kempf Kwyk Styk recurve at 51#. 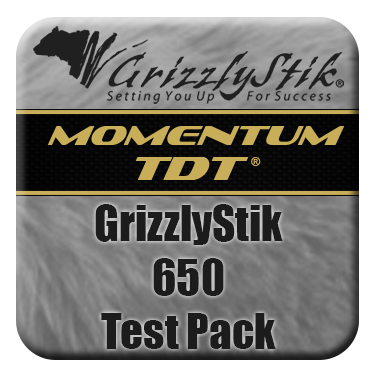 GrizzlyStik Momentums, 30", Broadheads are 150 gr. double bevel 2 blade Silver Flames. Total arrow weight 703 gr. FOC 21.7%. 140 fps. Kinetic energy 30.6 ft#s. Momentum 43.7 slug ft/sec"
"We were only in the blind for a couple minutes when a group of Eland headed right in, and with them was a very nice looking bull. I had just gone over shot placement with my PH when the Eland put himself in perfect shooting distance. I barely had time to think as I grabbed my bow and aimed. The Eland was at a perfect quartering away shot, but while I was a full draw he took another step and was then at a very extreme quartering away. I quickly put my pin back in position and pulled the trigger. Because of the angle I was worried that I had hit too far back, but the Eland only ran about 40 yards and then stopped. He tried to walk a little more, but couldn't and finally fell over and died. Upon recovery of the animal we saw that my arrow had penetrated over 3 feet and nearly had a complete pass through. My PH was shocked that my little 42lb bow with such a short draw length could get that much penetration on such a large animal. My arrow is a GrizzlyStik Momentum, total weight is 535 grains, FOC is 28%, and the broadhead is a 200 grain Samurai. The last picture of me with the broadhead was dug out of the Eland and it is still razor sharp!" Emily Thompson of Danger Close Outdoors hunting in South Africa with Chattaronga Safaris. "I shoot lightweight bows between 47# - 50#. That’s not a lot of power so I need the most effective arrows I can get. Since switching to 650 grain arrows with single bevel broadheads I have had complete broadhead penetration on every deer I’ve shot. It hasn’t always been that way..."